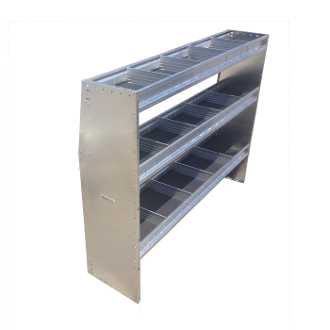 48” tall 60” wide 13” Deep shelving unit with 3 levels and 16 dividers. 2 lower shelves are 13" deep and 1 upper shelf is 11" deep. Includes 8, 13" dividers and 4, 11" dividers. Fits Low or Standard Roof vehicles such as Sprinter, Dodge ProMaster, Nissan NV, Ford Transit or any vehicle with 48" clearance. Multiple Levels can be evenly spaced or installed in desired Positions. Includes all necessary hardware to install. Shelving is 1/2” plywood wrapped with heavy duty non slip vinyl. Lightweight Aluminum Design. Usually ships by the next business day. Please allow an additional 1-5 business days for delivery to most US locations. Ships only by UPS Ground.